German news site Spiegel Online quoted Zhang Xin, head of Chinese developer Soho China and the client of Hadid's Beijing building, as saying: "Even as we build one of Zaha's projects, it is being replicated in Chongqing." According to Spiegel Online, Xin made the comments at the opening of Hadid's Galaxy Soho complex, another project for Soho China which opened in Beijing in October last year. 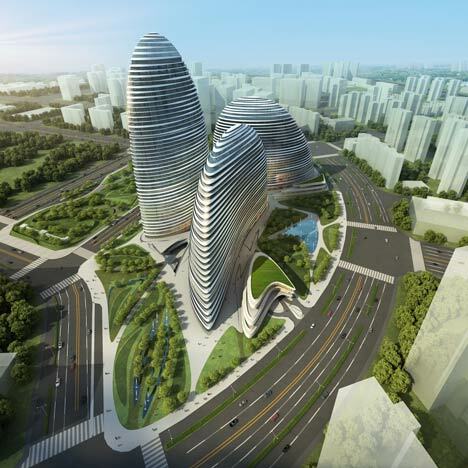 Xin added that the Chongqing project is being built faster than Hadid's original design. Satoshi Ohashi, project director at Zaha Hadid Architects, told the German website: "It is possible that the Chongqing pirates got hold of some digital files or renderings of the project." Ohashi added: "I am sure that some architect is already working on another version of the Guangzhou Opera House." The opera house, designed by Hadid, opened in Guangzhou in February 2011. In a report on the legal aspects of the case, China Intellectual Property wrote: "Up to now, there is no special law in China which has specific provisions on IP rights related to architecture."